Club Penguin Cheats by Mimo777 Club Penguin Cheats by Mimo777: Club Penguin Orange Puffle Update! Woot! Some real solid evidence that the orange puffle is coming. Nice work, Mimo. *after this my nickname will be OOMBFRN okok not! Cool I say the end of febuary or mid march. little sister loves that stuff we have one penguin plush and a set of mix and match,no puffles though. Oh and I think clubpenguin fixed the hiding spots at the pizza parlor and lodge attic. Cool!!!! My favourite colour is orange... when we can adopt orange puffle I'll diffently adopt one! look 4 me in CP! what is up with the last page in the adopt apuffle catalog has it always been like that?? Still taking suggestions for a signout! No it's not, I've been to 3 Disney stores and the release date it March. 1st! They refused to sell me one and said they cannot run it through the cash register until the release date so nobody can buy one! You're right! You can't hide anymore :( Aww! Thanks for sharing with CPG! Apparently the Orange puffle will be out after the puffle party! Because last year the white puffle was put in the pet shops just after the puffle party on march 5th! So I think this may happen to the Orange puffle aswell! AWW!! I Really want it but it looks pretty crazy.. I have a theory as to why there;s a new puffle. In the missions Herbert had plans that include the puffles. I think that herbert somehow was able to make a new puffle. Awesome I love your site, mimo IT rocks!!!!!! I doubt that mimo is online now. And mimo cant add you unless your a mimo mod or higher. Isnt it already the end of february? Thats great that you noticed and its not just at the puffle. But mimo posted this last April when it came out. Thats cool that you have some cp toys but dont put (CPG MOD) when you arent modding and they took away the hiding spots a long time ago but there are still some left. Im pretty sure we can adopt one in early,early march. Thats what happened with the white puffle. unfortunately, you can only be mimos buddy if you are a mimo moderator or higher. So, if you wanna be mimos buddy, keep reaching for the stars! aww! its sooooooo cute! i wanna get it and then show all my friends and throw my various collections of puffles at them! i call this game... puffle wars! mimo can't meet you because it wouldn't be fair to others who want to do the same thing, sorry. But, you can tell mimo the latest cheats. If he doesn't know about the cheat then he might post about it and give you credit! Oh yay I saw that too! i can't wait to buy him on cp! You are too fast! First commenter xD lol. Yeah, I heard it too! 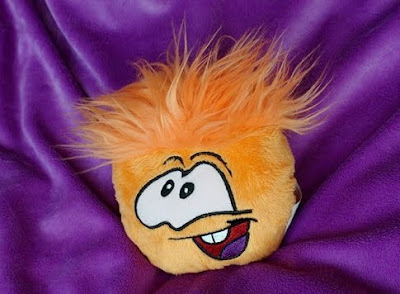 Lots of people have already bought orange puffle toy in the UK! And I think new puffle will be on CP Pet Shop this Friday! Its out in the UK March.1st Idk about other countries, soz! That would be unfair if Mimo777 adds you.. Because Mimo only adds Mimo Mods or higher ranks! he cant add you until you are a Mimo Mod. mimo already posted that. nice try though. Yeah,-that's right!! And I'm pretty sure Mimo saw that, too!! Thanks for your tip. You're awesome! That's right! CP fixed the ALL Hiding Spots! Now we are not able to walk under the chat bar!.. And CP fixed it months ago. Great! I think CP should make a new Aqua Puffle instead of magenta one! lol. Keep commenting and waddle on! Lucky! I really can't wait for the plushes! Yeah, I just noticed that... CP isn't very good at keeping something a secret! Yay! I guess you could call all of the sightings around the island some pretty solid evidence too! Keep modding and commenting, LilMan! I am sorry to say that Mimo can only meet you if you are a Mimo Mod or higher (see the Mod Rules for info on becoming a mod) or if you won the contest that had a prize of meeting Mimo! Sorry! Great observation! New orange puffle may be out in two weeks! Cool! Cant wait for new puffle! Actually, Mimo will only meet you if you are a Mimo Mod or higher or if you won a contest that had a prize of meeting Mimo! Uhh.. Maybe! I'm pretty sure, NEW mission will be about "puffles". 'Cause Herbert is planning something with puffles..
"Every Month" we have a moderator change! So please be patient and keep checking! You cant fly to UK just for an orange puffle? Lol, that's right! If I were you, I'd think just like you! Rofl. Keep commenting and modding, Sprocket! Huh? Adopt what in early March? Awesome! I really want to get a plush Toy, especially the puffles! Keep commenting, moderating and checking CPG! They did =(. Well, there goes my hiding spots lol. Me either! And if your not moding please don't put (CPG Mod). Thanks! Good theory! Personally I think it's out on April fools because it is so silly. Sorry! It would not be fair to add you when he has thousands wanting to add him, if you DO want him to add you become a mod and get into the rank Mimo Mod! dude chill! i dont think mimo ever posted that and it was fixed in jan. not last year. and 'working as Cpg mod'?? i dont think so! you cant say things with an attitude if u wanna be a CPG Mod! He can look for you but remember, he can;t add anyone until you become a mimo mod or higher! Im in the UK too and i know cause ive been to 3 disney stores! Yup! Nice job, Mimo already posted that though! Really? Nice job finding that! Yeah that looks right to me! As you must know that Mimo is very busy. He is making cool stuff for us. So he cant always meet penguins and add them. You can tell him the cheats all the time and he will give you credit. Plus, his friends list is full. You can be a Mimo mod and keep the Club Penguin Gang cool! WHen I was younger my whole neighborhood had a little "base" thing (it was like a giant empty room that could be used for anything) in the middle of the street. we used to bring bedding and tons of other things into this room and all day have a "beanie baby battle" where we'd all throw beanie babies at eachother. It was great fun! :) you're puffle thing reminds me of it. Cool, it's already out in the UK, yay!! The very back page is new! Good job finding that! Yup from what I hear, we should be expecting the orange puffle available to buy in the pet shop, march 5th. If they don't continue modding very well then next month Mimo will remove them! Great question. Even I worded something inccorectly a few days ago, and somone got upset, when my intentions were simply to answer the question to the best of my ability. Go easy here on the comments, if you think somone sounds rude, simply say "That comment came across as rude, i'm not sure if those were your intentions. Next time watch your wording :)"
I am not safa, but I can sort of answer the first question, because when i left, he was just starting. So i am going to say he started at the begining of August-ish. which means he's been modding for 7 months. He came in with a bang I remember and answered TONZ of peoples questions quickly and to the best of his ability. as for how many questions he's answered... all i can say is ALOT. You went skiing?? I went to church. 1.Mimo already posted this but good eye! 2.You hurt my ears and Mimo's,too. Please dont write in all caps. It is! But please do not comment stuff like "First" and "First comment"
Strangely,my chat bar wont apear when i log on and i cant click on my self or anyone.I need some help! im soo bored any answeres? Hey mimo we should have another protest type thing like the change languages thing. We should do it about having more than 100 buddies. ~~~~~~~~~~~~~~~~~~~~~~~~~~~~~~~~~~~I went to church too. Nice cheat! I saw that too. Sorry. Mimo can only meet you and add you if you are a Mimo Mod or higher, or won the latest contest. It would be unfair! Sorry! Yeah, they fixed that. I am sad about it! Oh, and don't forget to NOT put (CPG Mod) unless you are Modding! It will help you become a Mod quicker. Please and thnx! Kool I play alto sax as well. Yeah, probably so. Which confuzzles me, because they need their own posters, and beds and stuff! Hopefully they will update the catalogs soon. And only put CPG Mod when you are Modding, please! Well, by my experience Modding for CPG, it has been every month...or just a little bit passed. The last one was a few weeks ago, be expecting a Mod change in...oh, my guess is by near-mid-March. Good luck! First, don't use all caps, you hurt our ears! Yikes! Second, sorry to burst your bubble, but mimo already posted this. You need at least ten penguins orange and it comes! I know! It looks so cute! And remember to only put CPG Mod when you are Modding, ok? Not very good modding, you forgot to tell Bumper to only use CPG Mod when you are actually being a Mod! Well, I am guessing a long time from if you look at the bazillions of Mod comments from Safa in a row! Lol, Safa is an exellent Top Mod who deserves that title more than anyone on CPG! I don't think he keeps track of how many questions he's answered but...lets just say a lot! An Orange Puffle! Exciting huh? This is not a theory--it is right on the Club Penguin blog, newest post--a picture of that same thing. So look at the post, not the pictures only. That work as a signoff? I would think until the enxt Mod overhaul unless they Mod a lot more! Oh, I didn't see Toysgoneby's comment. I am not trying to be rude, but I think that you need to chill. How would you know if it was posted? They have probably been on CPG for a long time. And please don't criticize others if they want to be a Mod! Sheesh, I am sorry, but you are the one with the attitude, being mean to someone who hasn't done anything wrong! And I bet this person will make a great CPG Mod someday. Sigh, sorry if i lost my "cool" that I never had, but...yeah. Let's just all be nice and keep those thoughts to ourselves, ok? no that was up dated in 2009 when the white puffle came!! Hey! Criticize Alert!! Don't say someone isnt modding good! So he made a mistake, big deal! Everyone does! Plus, you could hurt someones feelings talkin like that! Listen! Must we honestly fight about this? No one was really wrong.. just copping any attitude (not pointing fingers, just talking in general) doesn't fly when you are trying to become a Mod, and if you are corrected and the information was wrong; it was just an innocent error! Can we just please keep our rude comments to ourselves, because, like I said, they do not fly whether you are trying to be a Mod, or just a CPG fan! Sigh you are right Toys. Sorry for getting out of hand! There's only 1 way to settle this... BREAKDANCE COMPITITION!!! Mimo's site is the best... I almost comment on every post(I might of used a differnet name)Anyway YOU ROCK MIMO! and I respect it! Hmmm, I wonder if maybe JUST MAYBE club penguin is gonna have an orange puffle. LOL! JK, but it's so cute with its little buck teeth. Sorry, but Mimo can only add you if you are a mimo mod or higher. Mimo does a moderator overhaul every month. I agree, everyone is doing a great job, especially Bobhead202... just kidding! What are ya'll talking about?? Were there secret rooms or something? ?